I always wanted a Jeep Wrangler, so when I came down with lupus and had to retire I said 'what the heck' and bought one. I made a mistake by going on ebay and looking at all the neat Jeep accessories..lol. I swear a fella could put a million dollars into a Jeep. What a blast though! 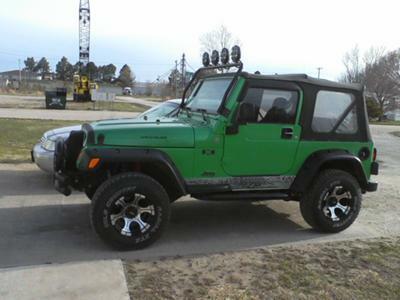 I don't do much off-road, but I sure get a lot of compliments on my lime green Jeep. Thanks to all the people who make neat things for us Jeep Lovers. 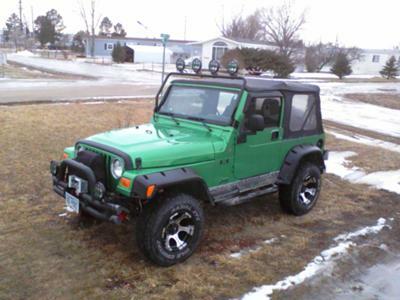 Larry's Comment: Nice Wrangler TJ, Bill! I like the "lime" green color, too! You should not have any problem finding your Jeep in a crowded parking lot, that's for sure.